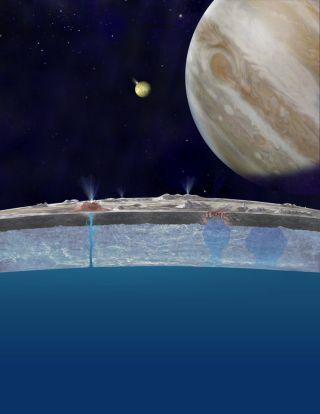 Jupiter’s moon Europa contains an ocean of liquid water beneath its frozen surface. Comets or asteroids slamming into Jupiter's moon Europa might explain the chaotic jumble of icy blocks seen across the satellite's surface, researchers say. This theory suggests that cosmic impacts might have helped deliver the ingredients for life into the hidden oceans that scientists think lurk beneath the surfaces of Europa and several other frozen moons in the solar system, investigators added. Europa is almost the size of Earth's moon. Under an ice shell maybe 10 to 15 miles (15 to 25 kilometers) thick, researchers think Europa possesses a huge liquid-water ocean up to 100 miles (160 km) deep. "Because most people believe that water is necessary for life, Europa is a strong candidate for an extraterrestrial ecosystem," Cox said. Europa's frozen crust would hide any ocean from view. However, clues about how this subterranean ocean behaves might be deduced from the moon's crust. Especially interesting to scientists are areas known as chaos terrain, where Europa's flat ice has mysteriously been broken up and moved around to form a weird landscape of jumbled blocks that resemble icebergs embedded in frozen slush. These odd regions cover up to 40 percent of Europa's surface. The origins of chaos terrain are strongly debated. Now researchers suggest that cosmic impacts might be the culprits. Numerical models suggest that impacts from outer space might have penetrated Europa's ice shell to expose the underlying ocean, potentially forming chaos terrain. For example, a comet 1,640 feet (500 meters) wide could punch through ice 3 miles (5 km) thick, whereas a comet 3 miles (5 km) wide could penetrate 25 miles (40 km) of ice. "It's beyond cool to think that impactors could breach Europa's ice shell and expose the hidden ocean," Cox said. No matter how thick Europa's icy crust is, comets or asteroids exist that are both large enough to breach it and likely to slam into Europa fairly regularly, the researchers said. They estimated cosmic impacts may have exposed the Jovian moon's ocean to outer space about every 3 million to 7 million years. Other explanations for Europa's chaos terrain focus on internal energy sources that might trigger melting within the ice shell, such as churning within its subterranean ocean. Cox suggests these other factors might also play a role in this moon's features. "We know very little about chaos terrain, but we do know that there is a range of different types of chaos," Cox said. "There's no reason to assume that a single mechanism formed them all. It's entirely possible that some chaos areas might form as the result of internal processes, and others might be the result of impact." Cox and Aaron Bauer at Williams College detailed their findings online Oct. 14 in the Journal of Geophysical Research: Planets. They will also present their findings at the Geological Society of America meeting in Baltimore in November.